Our Mission: Transforming hearts, minds, and souls; by sharing Truth and showing true love through Jesus Christ to women and their children who have no voice in this world. Sherry recently made a trip to Ethiopia bringing gifts provided by our donors and by Thrivent. She brought gifts for the children, supplies for the ministry, and clothing for the families. The day was filled with celebration, playing games and enjoying Ethiopian food. We love our families and they love us. It is a pleasure to serve them and we are grateful to God for your support. 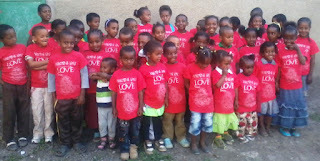 Transformation Love is a recognized 501(c)(3) non-profit public charity working among the poorest of poor in Ethiopia. We focus our efforts to working among those affected by HIV in the Korah area of Addis Aababa. Through our child sponsorship program we are able to bring the help needed to change lives forever. Transformation Love is Changing Lives!